One of Nike's most popular collections ever is now ready with a new super hot colourway. Various football stars already showed their support and used this new boot last weekend. 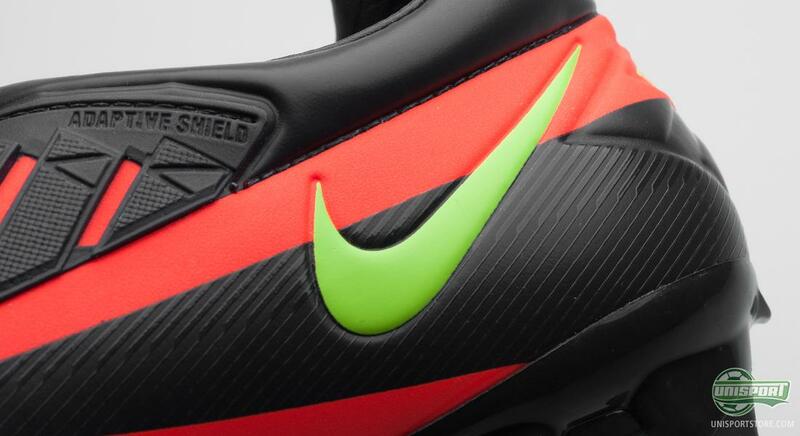 Please welcome the Nike T90 Laser IV ACC Brigth Crimson/Dark Obsidian/Electric Green. Let's take a closer look at the boot, which is also equipped with the exciting new All Conditions Control technology from Nike. Super stars such as Wayne Rooney, Fernando Torres, Wesley Sneijder and Vincent Kompany all support the Total90 collection, and are already showing their support for the new colourway as well. 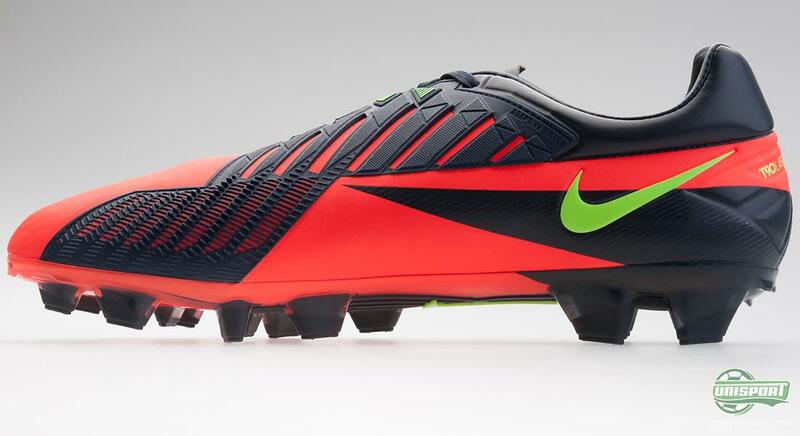 The very diverse list of players supporting this boot is just an expression of how versatile this boot is. No matter if you are a goalkeeper, defender, midfielder or striker, this might very well be the right choice for you. The Nike Total90 collection has always had a strong focus on both power and precision, and this has certainly not changed. 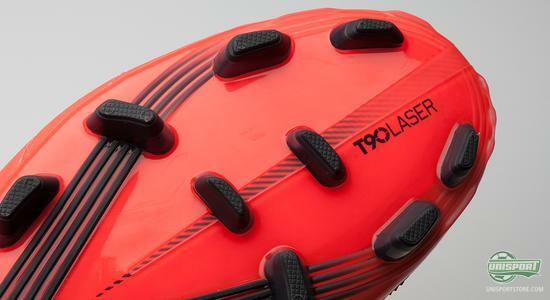 The boot is equipped with a two-split Adaptive Shield area, one for increased power and one for providing increased spin to the ball. The upper instep is equipped with a power-zone, thus letting you strike the ball with a lot of power, as well as, accuracy. On the medial side of the forefoot the boot is equipped with small fins, to help you get more spin to your strikes. 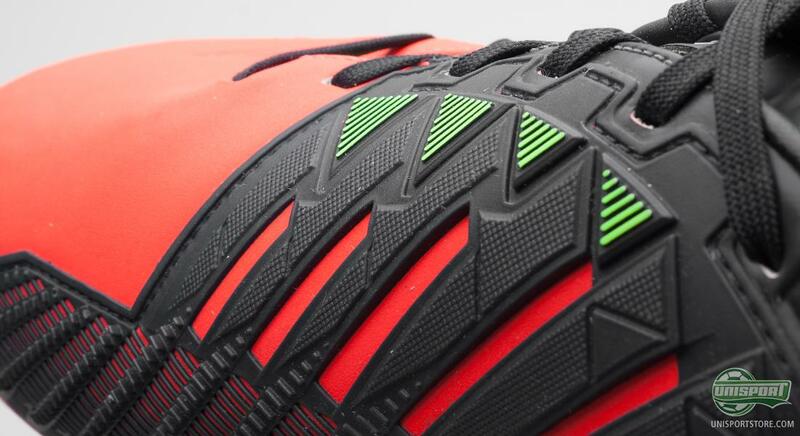 The fins create more friction and ensure good ball control. We have tested the new technologies and are very satisfied. 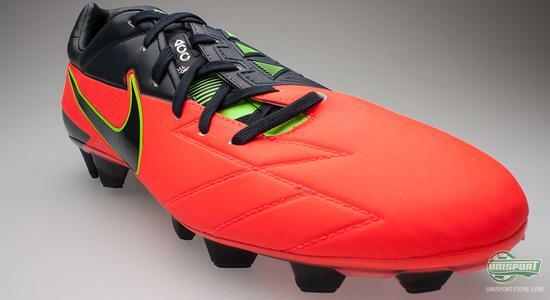 If you are looking for a boot with a proper strike, this might very well be your match. 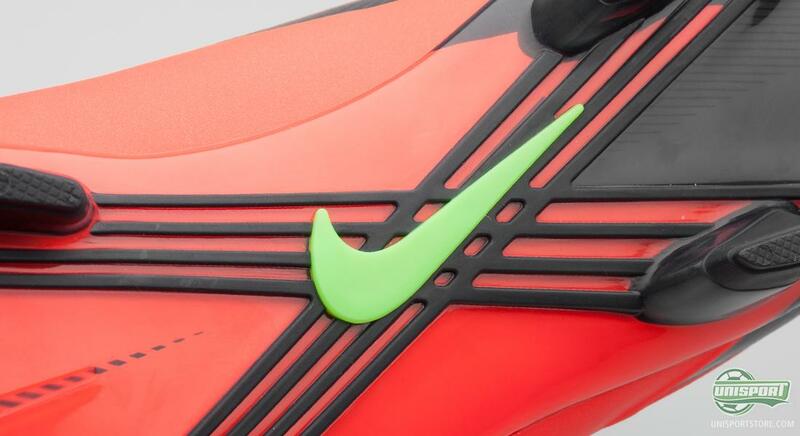 In addition to providing increased spin to your strikes, the little fins are also a great help for your dribbling. No matter the weather conditions this boot will provide great ball control, and you will have a very confident ball touch. Combined with the new ACC (All Conditions Control) technology, the result is an absolutely phenomenal ball control in all weather conditions. 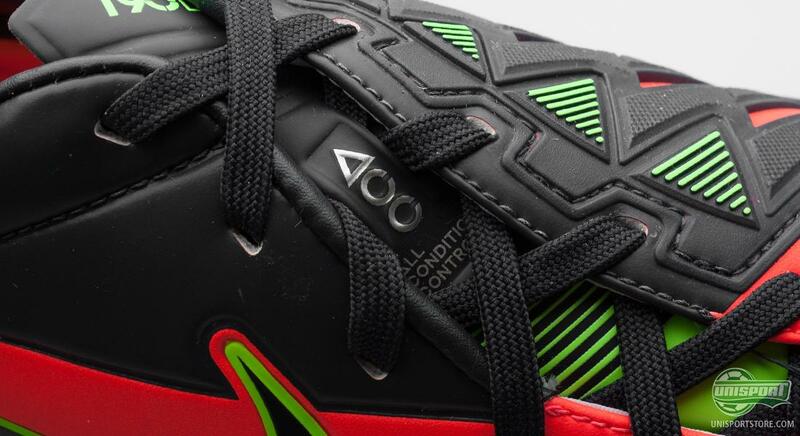 The ACC is a new addition to the Total90 collection, which has also been implemented to the other three key boot silos from Nike. The new stud system is equipped with brand new TPU studs that provide an exceptional grip to both dry and wet pitches. 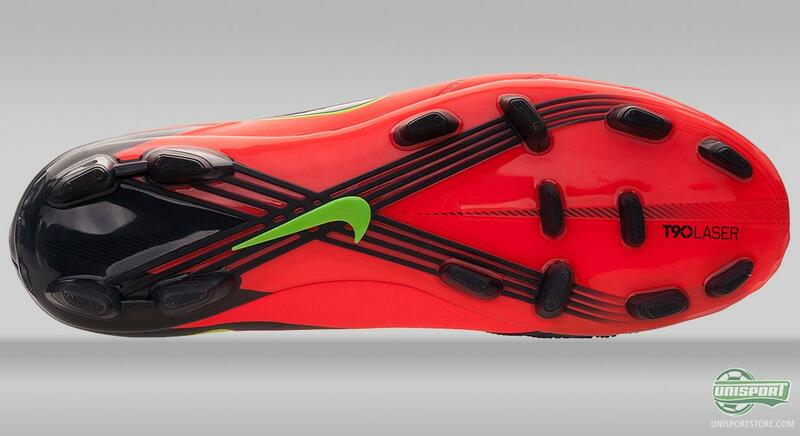 The blade shaped studs provide increased acceleration and pitch grip, and twist and turns will become easier. Thanks to an upper made from Kanga-Lite, combined with the anatomically correct inlay soles, you will also have the stability needed to make quick twists and turns. With previous generations of the Total90 collection you always had the opportunity to choose between a leather upper model and a model with a synthetic upper. 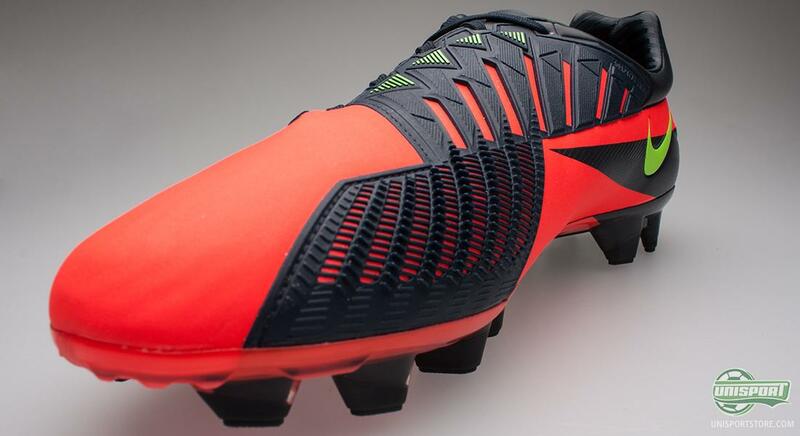 This actually had two of the leading figures of this boot go each their way, as Fernando Torres chose to use the leather model, whereas Wayne Rooney usually would use the model with the synthetic upper. 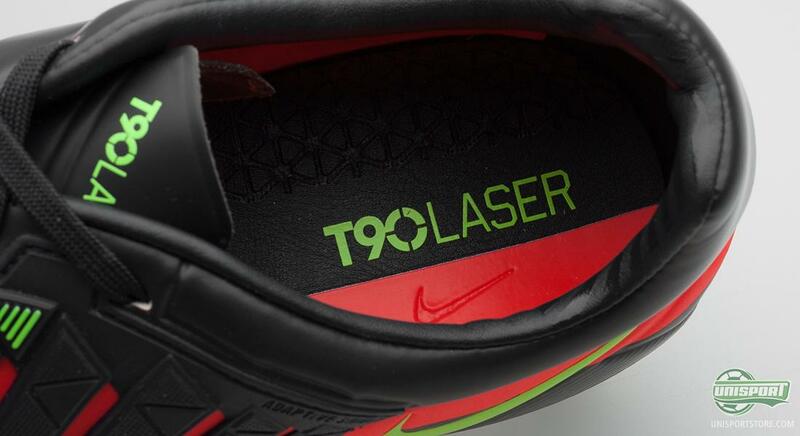 The new Laser IV is different, and a Kanga-Lite upper is the only alternative. This may very well be read as a sign that Nike have trust in their Kanga-Lite, and feels that it is ready to replace the leather model. If you have tried out a Nike CTR360 Maestri, you will have experienced how fantastic the material is, and that it is very similar to real leather. In addition, Kanga-Lite is more water repellent and lighter when compared to real leather, which is a great advantage. If you cannot wait to get your hands on the new colourway, we are ready to help you. 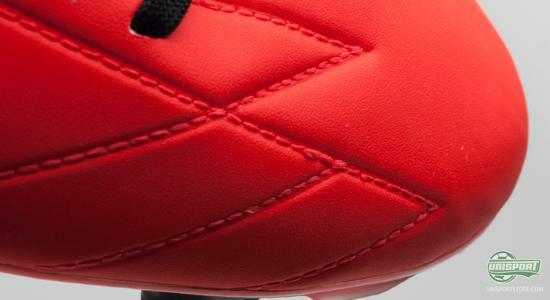 The new boot can be pre-ordered from Unisportstore.com already from this Thursday. 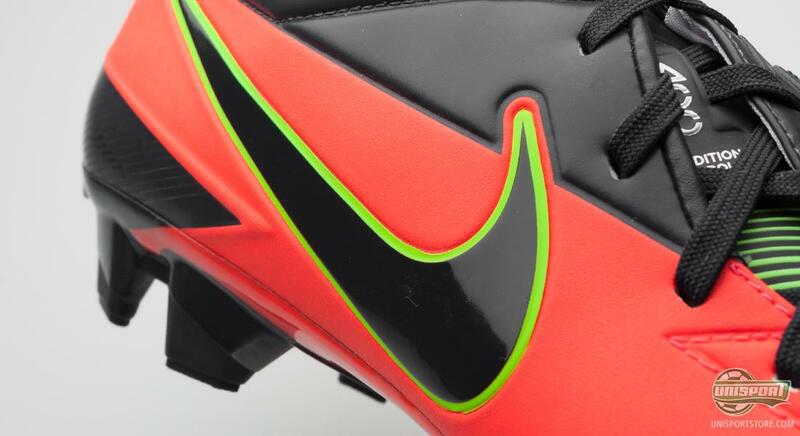 The new Nike T90 Laser IV Brigth Crimson/Dark Obsidian/Electric Green already had a goalscoring debut, as Rafael scored against Liverpool wearing this boot during the weekend. Did you get a chance to see the boots in action? What do you think of the new colourway? Feel free to leave us a comment in the field below.